Because Badgers are constantly on the move, United States Geological Survey Agency needs your help to find out more about Badgers in San Diego County. They need information on siting sof the dead or alive. Read about the information needed and where to report your sightings in the flyer below. Their primary prey are small mammals such as squirrels. American badgers prefer open scrub or grassy areas and are known to move up to 10 miles a day in search of prey. Researchers can use badgers as indicators of habitat connectivity for conserved uplands in San Diego. If a badger is successful in moving through uplands constricted by urbanization or roads, and able to find a mate or obtain food, this may indicate the landscape is also connected for a suite of smaller species that use these same habitats. 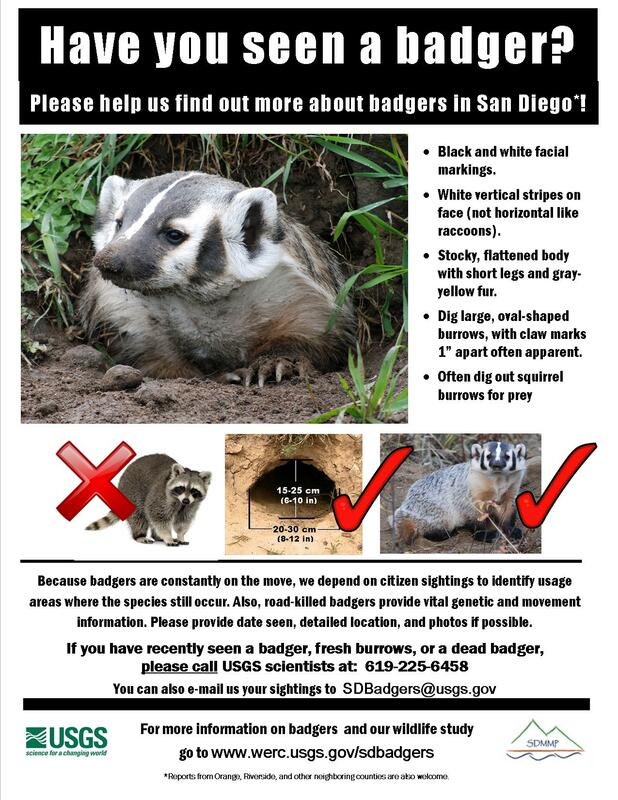 In other words, what is good for badgers in San Diego County is good for other smaller animals in the urban habitat.